Saute the minced onion in the olive oil until the onion is glassy. Add the tomatoes and reduce heat to simmer. Add the herbs, lemon juice, salt and pepper and continue to simmer on a low heat. Season to taste with additional salt, pepper and cayenne. 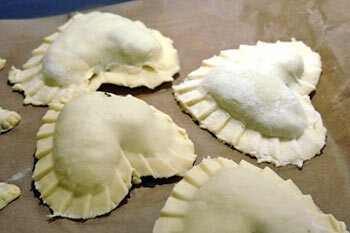 Divide the dough in fourths and roll out each portion on a floured work space, allowing the first sheet of pasta to sit while rolling out the second. 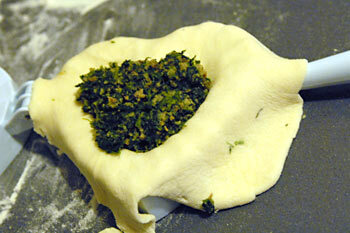 One of the tricks to the pasta is to make sure you’ve rolled the dough out very thin. 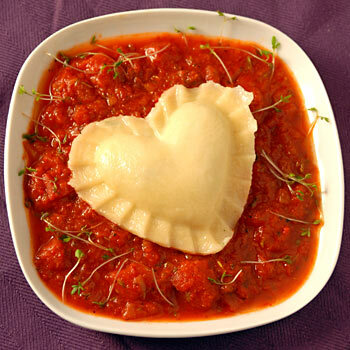 Cut out your ravioli shapes and fill with the filling. 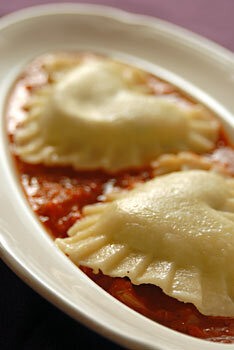 Place the top part of the ravioli over the filling and close with a fork. If you have a form or press, then of course that saves time you merely place 1 sheet of dough on one side, put the filling on the dough and then lay the 2nd sheet of dough on top. Close the form to seal and cut off the extra using a knife. Meanwhile, bring a large pot of salty water to boil. 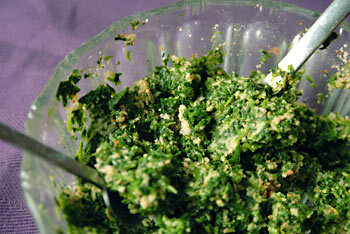 Posted by Chris Walker on February 9, 2007 in Main Dishes, Spinach, Tomato.